Larger than life Diwali bashes that Bollywood kings and queens throws every year have become some of the most awaited occasions looked up to by all. I love seeing celebrities turning up decked out in their best ethnic attires, all the pomp and show, colors and bling. 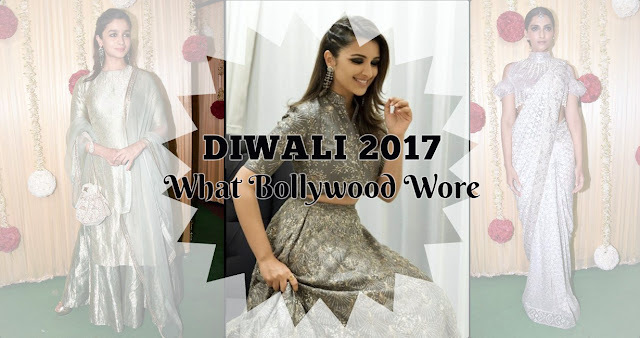 It was DIWALI day before yesterday and our favorite Bollywood stars strutted their fashion foot forward at those various Diwali bashes. So lets implore their looks without blabbering any further. This woman never fails to turn heads with her impeccable sense of fashion. The fashionista looked winsome in white at the Diwali bash of Ekta Kapoor. 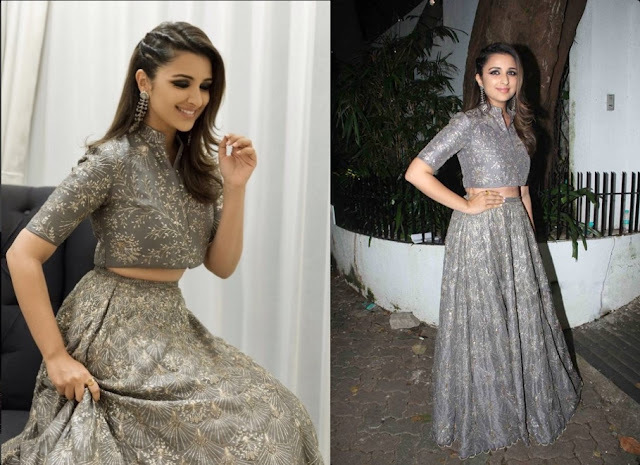 She chose a white and silver Abu Jani Sandeep Khosla saree and paired it with the very trendy cold-shoulder sequined blouse. Her signature smoky eyes, minimal jewellery and a neat bun completed her look. For her second look she chose an super gorgeous blue and beige lehenga with intricate work. Love her wing and her choice of jewellery. This lady hardly goes wrong. She looked ethereal in a golden hue Anamika Khanna saree paired with a ruffled blouse. She kept her hairstyle simple, makeup minimal and let her red lips do all the talking. Kareena looked like a queen in a pale gold heavily embellished ensemble from Tarun Tahiliani’s collection. Love the tassels on the hem of the kurti. Emerald and diamond jewellery added extra oomph to her look, whereas the bun added a dose of elegance. Saif Ali Khan looked quite handsome in a maroon kurta and white pyjamas with black shoes. 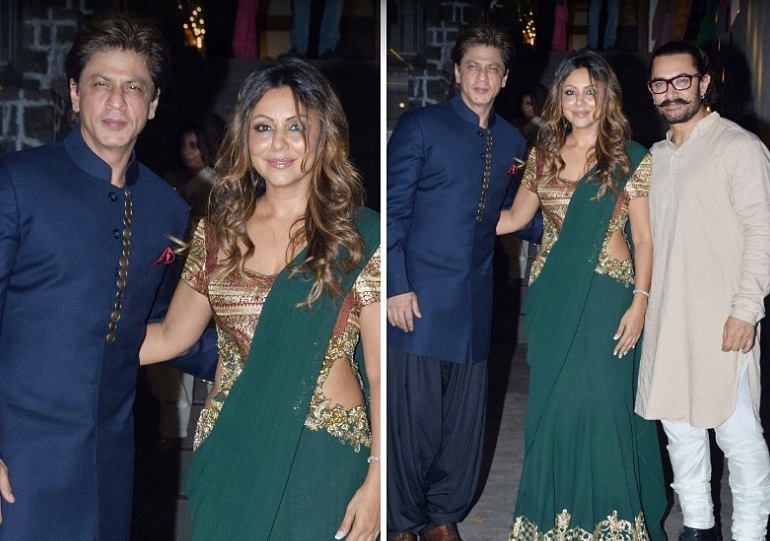 The badshah of Bollywood Shah Rukh Khan was present at Amir Khan’s Diwali party with his begam. SRK was dressed in a classy velvet blue bandhgala and black harem pants, while Gauri Khan went for a green sari with gold appliqué work. The handsome host went for a simple kurta-pyjama. Don’t miss his trademark glasses. Alia was spotted in a gorgeous green silk embroidered lehenga by Manish Malhotra. 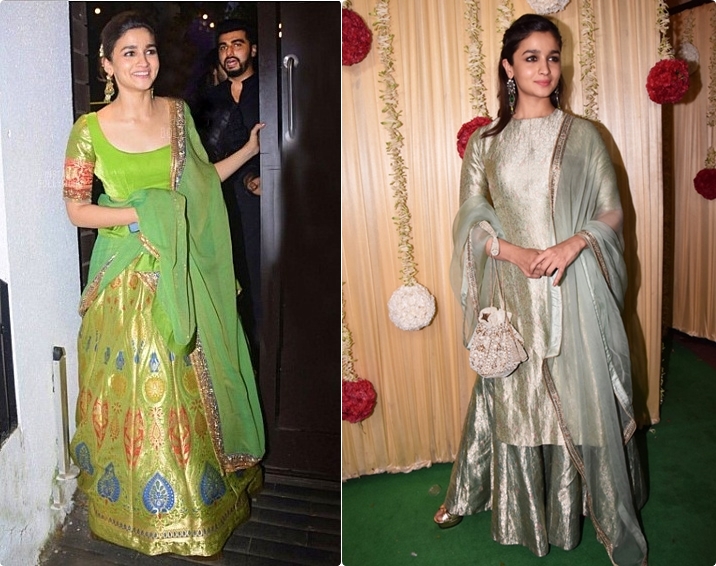 She paired the lehenga skirt with velvet scoop neck blouse and a green dupatta. Antique earring, hair tied in low bun and subtle makeup rounded up her look. Whereas, in another Diwali party, breaking all the “break-up” rumours, Alia Bhatt arrived at the party hand in hand with Sidharth Malhotra. She looked cute as a button in sage-green brocade kurti-skirt set by Sanjay Garg. 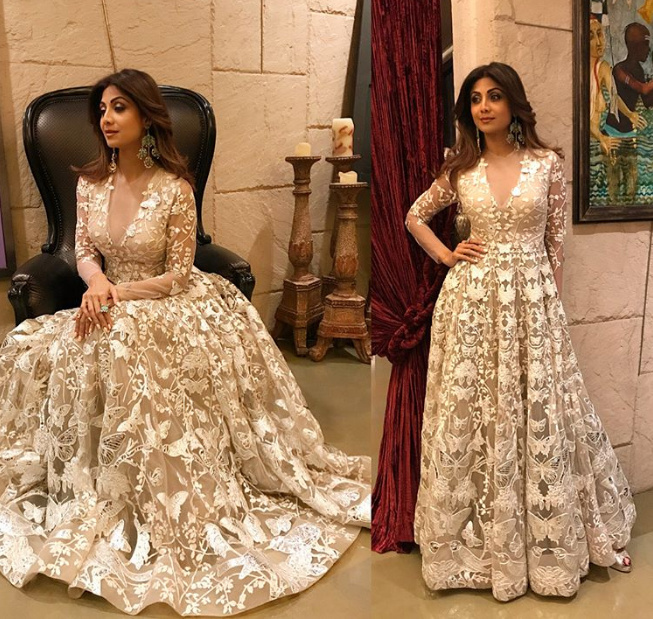 We have four stunning Diwali looks from Shilpa Shetty’s album to drool over. The first look is from Ekta Kapoor’s Diwali Bash were the gorgeous actress was seen draped in a beautiful red leheriya saree by Raw Mango, Sanjay Garg. She went for traditional jewellery from Anmol jewellers and Jaipur Gems. Gajra adorning her traditional bun and kohled eyes accentuated her look. For her second look she opted for a stunning maroon saree paired with an even more stunning silver bling blouse. Her ensemble was from the house of Manish Malhotra. Her third look, she was all smiles for the camera wearing a white ensemble from Manish Malhotra again. The floral patterns, the fringes on the one-sided blouse, the side bun, the diamond and emerald neckpiece, everything was so chic and stylish. Her final look, she looked absolutely stunning in the exquisite Falguni Shane Peacock anarkali gown. No words! 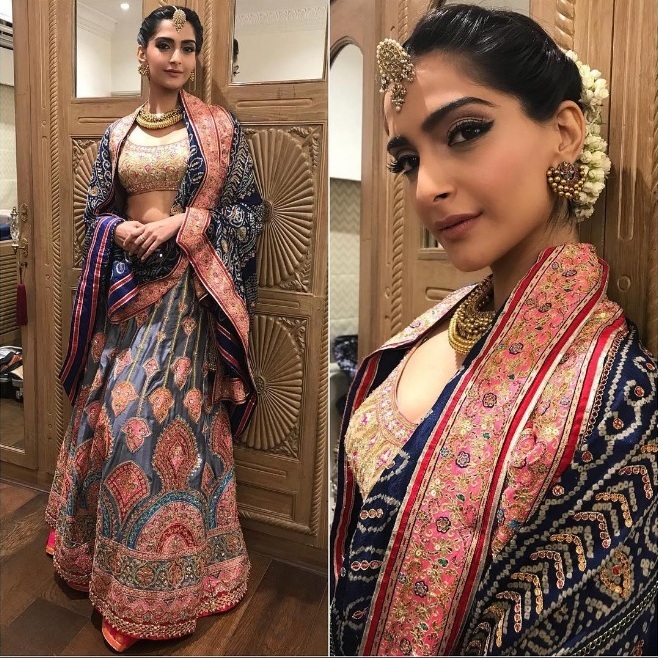 The Anamika Khanna red lehenga looked amazing on this Bolly beauty. Don’t you think so? She looked pretty in a silver crop top and skirt by. Silver danglers, smoky eyes and that hairstyle just blew my mind away; loved the combination on this bubbly actress. She looked simple, yet very pretty in the Varul Bahl jacketed gown. Looks so calming. The saree queen was snapped wearing a super gorgeous saree by Pinnacle. Traditional jewellery from her favourite Amrapali Jewellers and a potli bag from Boga completed her look. The pretty actress was snapped wearing a beautiful crop top and lehenga skirt by Manish Malhotra. Sans jewellery and with minimal makeup, she let her dress do all the talking. At another party, she was snapped in a blush pink outfit from the house of Faabiina. The pretty, chic hairstyle and statement earrings completed her look. 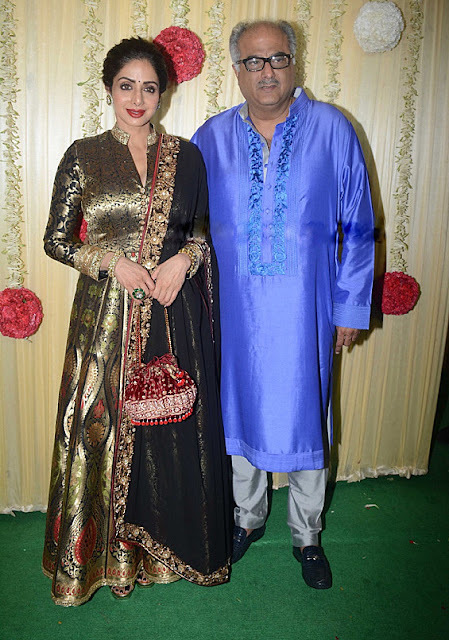 The gorgeous lady was spotted with husband Boney Kapoor wearing a stunning Manish Malhotra brocade gown which resonates festive season. The red potli bag looked beautiful in contrast with the black ensemble. Boney Kapoor chose to wear a silk blue and steel grey kurta-pyjama set. One of my favourite Bollywood real-life couples, the duo always looks great and complements each other so well. 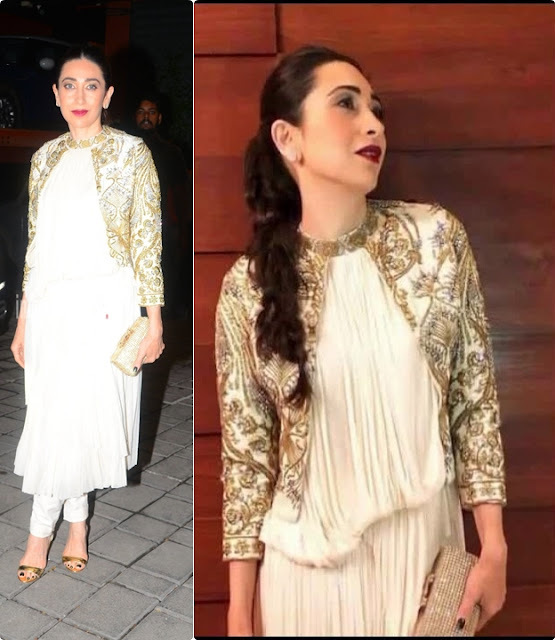 For Ekta Kapoor’s Diwali bash, Miss Funny Bones was seen in a cream floor gracing gown by Manish Malhotra. For accessories she chose long emerald earrings and a ring. While hubby, Akshay Kumar looked dapper in an all-black outfit. She was spotted in a fusion number from Varun Bahl’s Couture. It is a white suit with sheer detail, teamed with a golden embroidered jacket which elevated the glamour quotient of the outfit. The dark lips complemented her look really well. The ever gorgeous lady was snapped wearing a stunning floor-length brocade gown by Manish Malhotra. Uber stylish and comfy, I felt the attire was very apt for Diwali. Open hair, minimal accessories and subtle makeup to round off her look. She chose to go all traditional with a traditional lehenga choli, a cleek bun, small bindi and gold jewellery and a gold toned clutch. 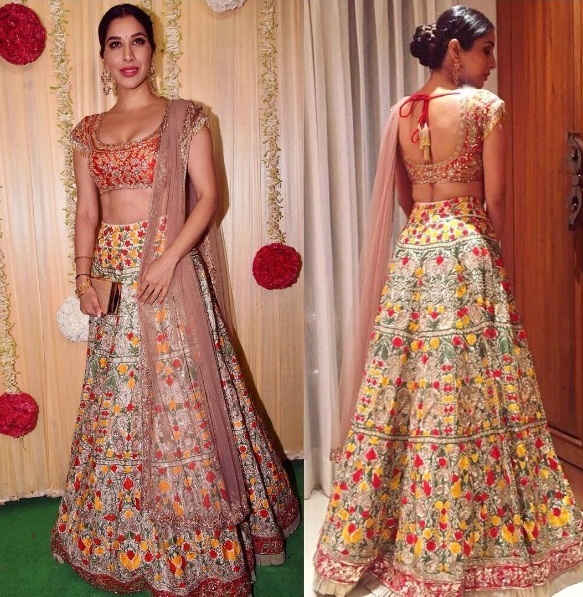 The lehenga was from Manish Malhotra’s collection. 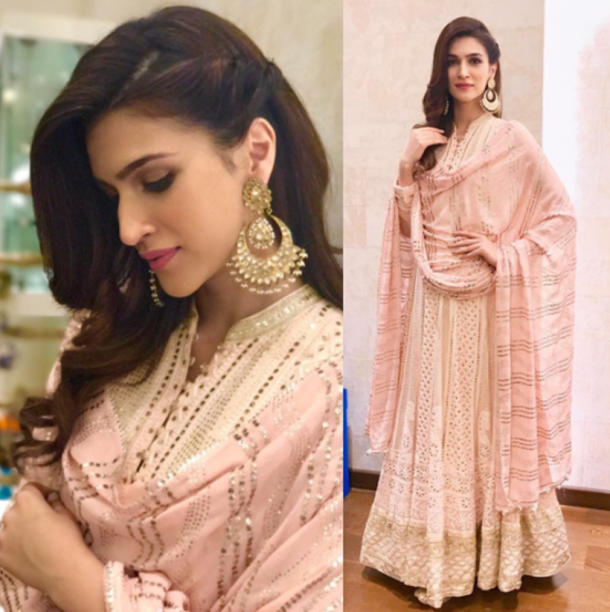 She was spotted in a Nikhil Thampi white and gold kalidar which she paired with tulle dupatta, a beautiful polki choker and jhumka set from Joolry.